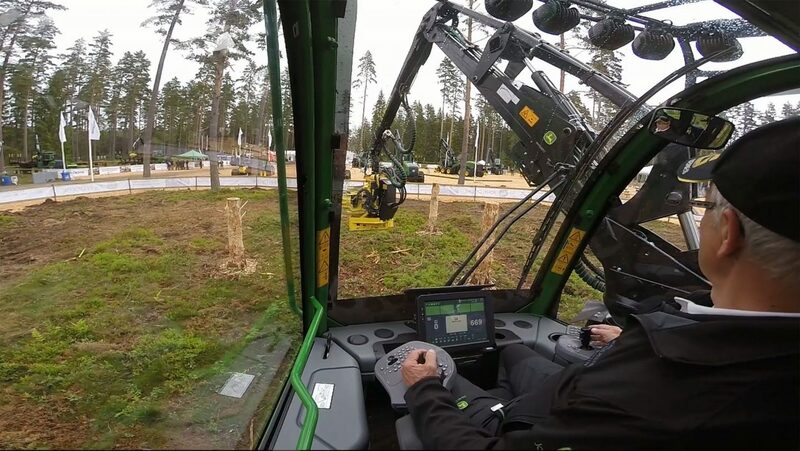 John Deere presents their first Crane-Tip control, named IBC, for CTL harvesters on Elmia Wood 2017. Previously, IBC has only been found on a selection of John Deere forwarders. Unfortunately, it has become a bit of mysticism about crane-tip control and also the John Deere variant known as IBC (Intelligent Boom Control). The reason is probably that it’s hard to explain briefly and easily, but I’ll try. The basic function of all hydraulic cranes is that a lever actuates a hydraulic valve that sends oil to a cylinder which in turn affects the crane’s position. Simple, and how it works even today. The difference today is that the lever affects a potentiometer that sends an electrical signal to an electric valve in the valve kit, which in turn opens its valve as much as needed. Crane-tip control use the power of computers and by preprogramming, one lever movement can affect multiple valves at once. 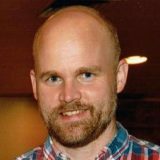 You get a predefined motion pattern that designers have carefully programmed to fit the vast mass of machine drivers. IBC, one can say, is version 1.0 of Crane-Tip control. All honors for JD who launched the system, but I’m writing version 1.0, because the definition of Crane-Tip control may mean more. Example is when you only have a single lever in the cab that controls the crane. Moreover with no lever at all, just a laser pointer the driver uses to point to a tree and the crane going there (X, Y and Z axis), and then fully automated functions after that. However, John Deere took the step to version 1.0 of the crane-tip control to forwarders a few years ago. Simply meaning that the levers and cabins look exactly the same as before (you can even deactivate the IBC system if you want). The basic function of the IBC is that the boom extension automatically protrudes when operator activates “centre out” (the left lever is pulled forward). You do not need to use the extender boom rocker, the computer does that for you. The IBC also has position sensors in each hydraulic cylinder on the crane. It’s a must to get a user-friendly and secure system. Example of usage is if the main boom is in its lower position, the main boom cylinder sends a signal about its location to the computer and if the centre boom gets activated, the extender will not be used. That would send the harvester head into the ground. End position sensors in each cylinder also get a positive side effect – end position damping in each function. This is a very good feature that both saves machine and driver, effectively reducing hard, metal-to-metal, shocks when end position reached. In addition to the fact that the centre boom has been partially automated, there are some other functions in the harvesting version of the IBC worth noting. 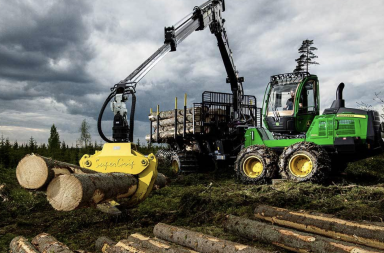 When felling trees on max reach, the boom extender gets activated first upon retracting the crane after felling. That is faster, and more efficient. At full arm the slewing function on the crane turns automatically slower. JD emphasizes this well in thinning, but it is generally a good feature. When bucking, the crane speed is adjusted and width tree diameter over 20 cm, some of the functions are slower. This is to make sorting more efficient and less stressful. 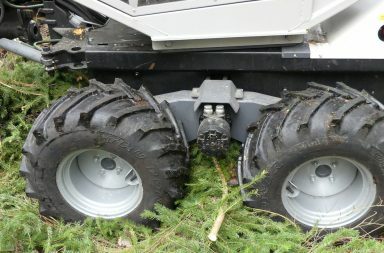 After felling, the boom extension get activated first (as stated above), but then it is set in a pre-programmed position to get as optimal bucking height as possible. Possible downsides of IBC would be the added investment cost of course. What the ROI will be is a secret of the contractor, ROI is also individual of course. 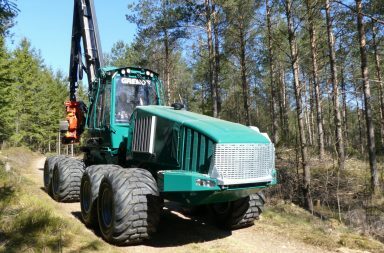 One other downside could also be that new operators that only has operated a forestry machine equipped with IBC, will have difficulties operate a crane without IBC. IBC has probably come to stay, reports also claim that competitors to JD (at least some) have similar systems running on tests. What is exciting is that the system is already adapted to Crane-Tip control version 2.0. It would be astonishing if the manufacturers are not already in their prototype workshops going bananas testing new features. What I’m thinking about for harvesters is perhaps the main function for the bucking process that now could be automated. Just tell the system how many yards from the machine the first pile of timber would be, the rest is simple programming. Auto bucking process in the harvester head is standard since a long time. Then it is only to positioning the head at the first pile and then as a operator, monitor the quality of the tree and that the unit is properly functioning, each assortment has its own pile. For forwarders, automatic loading in final felling is something that should also work. When we reach such solutions, I think Crane-Tip control is a great feature. It’s incredibly important with micropauses when you drive a forestry crane, if you get these small breaks, the performance will probably increase and drivers will also have a more comfortable day in the cabin. IBC for harvesters is planned to reach the market Q1 2018. A short video demonstrating the IBC, test drive included.